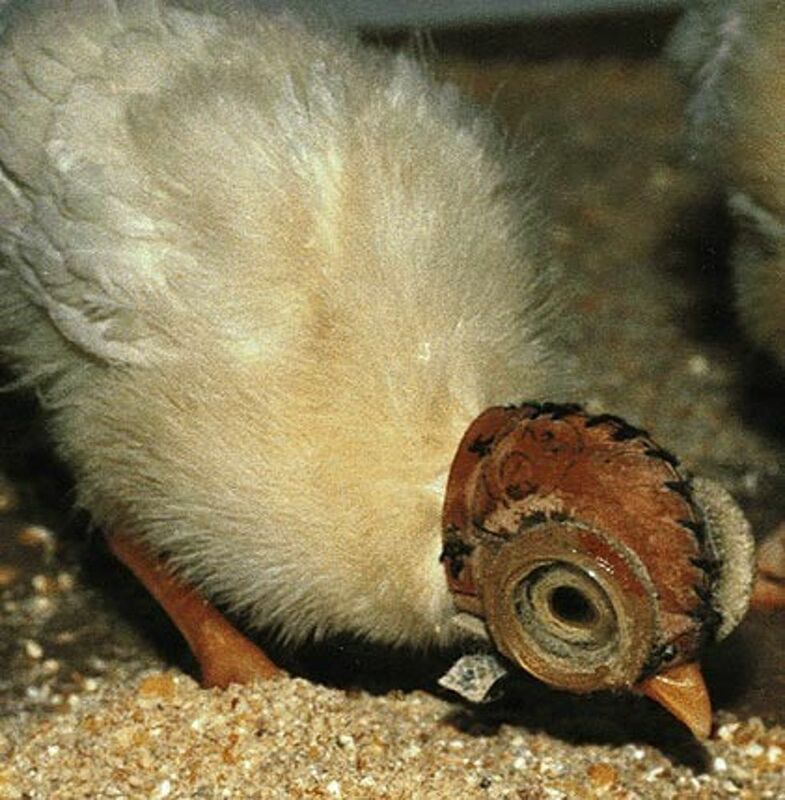 When we found in 1987 that young chickens, treated with spectacle lenses (Figure 1), change their eye axial growth exactly so that they reach again normal refractions - with the lenses still in front of the eye -, we (with my co-authors Adrian Glasser and Howard Howland) believed that we had found "the mechanism" that also drives myopia development in humans (Schaeffel et al, Vision Research 28, 639-657, 1988). We also thought that, after a detailed analysis of the biological mechanisms, myopia in humans could be understood and prevented. While a lot was learned subsequently from such experiments in different laboratories (like that the "visual control of eye growth" is achieved by the retina itself, and that the retina can even determine the sign of dioptric power of the lens) - it remains unclear why children become myopic before they were wearing any lenses. The question remains: what kind of visual experience in daily life is similar to wearing negative lenses? While there is little doubt that "near work" is a factor associated with myopia in most epidemiological studies, the statistical association is not always very high, suggesting that it may not be "the key factor". It has been measured that most people do not accommodate perfectly when reading a text on the paper, but rather focus a little bit behind - which place the plane of focus behind the retina, just like with a negative lens. However, that this factor relates near work to myopia has not been proven. Other factors, quite unexpected, were recently found that had high associations with myopia in children: in at least four large studies, children had a lower risk of myopia when they were more often outside. Even a dose-response relationship was found. In fact, children with the highest rate of myopia (Singapore) were outside less than 3 hours a week. While one might think that the inhibitory effect of outside activity on myopia is due to the longer viewing distances, and the lack of "near work", our recent experiments in chickens show that the development of deprivation myopia (induced by frosted diffusers in front of the eye) is inhibited by high light levels. If chickens are kept in the lab at different ambient illuminances, they develop the less myopia the higher the illuminance. The lowest amount of myopia developed, however, if they were exposed to day light on the balcony (Ashby and Schaeffel, presented at ARVO 2009). In this case, myopia inhibition has nothing to do with imposed defocus. It could be that temporary exposure to high light may represent a simple way to interfere with myopia also in children - monkey expriments are planned. what exactly is the genetic basis of myopia? It is well know that the risk of becoming myopia increases severely with the "number of myopia parents". Furthermore, there is a high association in of refractive errors in dizygotic twins, much higher even in monozygotic twins. While the problem of "shared environments" of parents and children cannot be ignored, there is little doubt that there must be genes that predispose an individuum for myopia development. It was just found that optic baseline variables in the eye - corneal curvature, aneterior chamber depth, vitreous chamber depth and eye length are inherited in chicks (Chen et al, ARVO 2009). 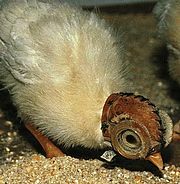 Furthermore, we found that each chick has its, most likely inherited, baseline refraction, to which it also returns during recovery after it has been temporarily made myopia - and that the amount of myopia that can be induced in an animal seems also inherited (Tepelus and Schaeffel 2009, unpublished). Since all these variables seem genetically determined, it really makes sense to look for loci on the chromosomes where polymorphisms are associated with myopia. Many large studies have already been carried out, and at least 15 loci have been identified (called "MYP1 -15"). Some candidate genes are currently also examined. how could we interefere with myopia development optically? Since it is known that eye growth is guided by defocus, the exact central and peripheral patterns of defocus appear as critical variables. Regular spectacle lenses for myopia correction often impose relative hyperopia in the periphery which could further stimulate eye growth into myopia. In 2005, it was found that also in monkeys myopia can be induced by degrading the peripheral image sharpness with diffusers in front of the eye with a hole in the center - so that the fovea still had normal vision (Smith et al, Invest Ophthalmol Vis Sci. 46, 3965-3972). New spectacle lens design are currently tested that impose myopia, rather than hyperopia, in the periphery with the hope that they reduce myopia progression. Due to our poor spatial resolution in the periphery, defocus in the periphery is not detected - the major problem are distortions induced by such lenses (Vasquez et al, ARVO 2009), well known to people wearing reading glasses (progressive addition lenses). In the framework of our RTN of the EU ("MyEuropia", www.my-europia.net/), Juan Tabernero (ARVO 2009) in our lab developed photorefractors to scan peripheral refractions over the central 90 degrees of the visual field within a few seconds, with and without glasses. We assume a relationship between myopia progression and the patterns of imposed peripheral refractive errors also in children. The exciting idea of inhibiting axial eye growth by drugs, applied as eye drops, is still pursued. However, the drug that was most close to marketing (pirenzepine, a muscarinic antagonist) did not make it because the phase III studies were required to run 5 years - which makes funding very difficult. Nevertheless, there are striking effects of "drugs" on myopia development. We (and the laboratory of Josh Wallman at the same time) found in 2007 that insulin has a very powerful myopia-inducing effect in the chicken model (Feldkaemper et al, Invest Ophthalmol Vis Sci 50, 13-23, 2009) but preferentially when the retinal image sharpness was reduced at the same time by spectacle lenses. The retina looses its ability to recognize the sign of imposed defocus and only stimulates myopia. It is clear that it would be most intriguing to find out how insulin interferes with the retinal image processor that guides axial eye growth, and this is a major current project. Myopia is not only the worldwide most frequent ocular disorder in adolescence, with still no satisfying rational therapy, but also a very interesting biological problem with many open questions. After we had learned in the past years how "perfectly adapted" the optics of the human eye is to our needs (e.g. Artal & Tabernero, Nature Photonics 2, 586-589, 2008), it is clear that myopia is not a matter of "inaccuracy" in biological design - but somehow intended, in response to an inappropriate input.